Driven by the creative process, The fall for florals team seek to bring a little refinement in the organic structures of their designs. Working in neutral tones and polished color palettes they strive to create floral pieces that are timeless and thoughtfully designed for their couples. Combining her love for flowers and creative flare, Lindsey has been in the floral industry for over 15 years. As a young and enthusiastic entrepreneur, she is continuously learning and growing in the industry by connecting with other creatives. Finding her design inspiration through nature, interior design, fine art and costume design, Lindsey loves floral designing with an aesthetic that is intentionally imperfectly perfect. She is happiest when she is working with her hands, planning out the next design or when she's on the couch binge watching shows with her two pups! With her love for flowers beginning at a young age, Kelly has now been in the floral industry for over 8 years. 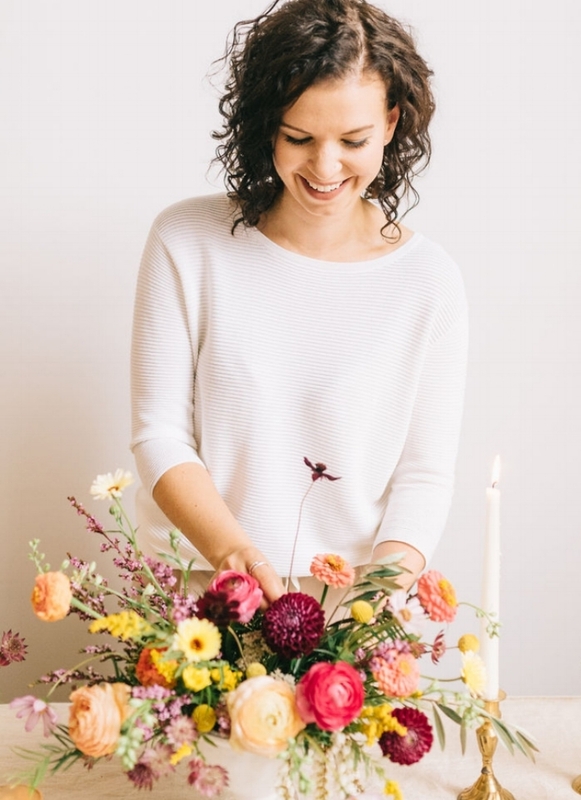 Talking all things floral with their clients fuels her creative drive. When floral designing, Kelly strives to find a balance of a timeless design that also compliments the couples uniqueness. When Kelly is not flowering, she can be found snuggled on the couch with her two kitties or heading to the mountains for her newest adventure. Some of Kelly's favorite flowers and foliage include cosmos, helleborus, flowering dogwood, bush ivy and jasmin vine. The biggest dreamer, finding love in just about everything and anything! Tram will be the one guiding you through your initial wedding consult, helping you determine where your floral priorities are! With her passion for community, Tram is the gal that can offer you recommendations for just about anything available in the city. Tram’s easy going personality and kind heart allows her to connect with our couples with ease, opening a line of communication that is honest and sincere. Her invested nature to care for just about anyone she meets will leave you feeling listened to and feeling good that the Fall for Florals team will be able to put your wedding dreams to reality! With her eye for detail and love for weddings, Shayla is the gal you'll see behind the scene with all things set up, going above and beyond to ensure a flawless production from start to end. Shayla's wild sense of humor and energetic personality keeps the adrenaline going long after the designing phase, and well into the night with tear down and clean up. With a natural knack for being organized and keeping on schedule, Shayla is a pro when it comes to wedding execution. Don't be shy, when you see her at your wedding - she always has a few jokes up her sleeve that'll be sure to get you chuckling! Fall for Florals started in Calgary, AB June 2016 as a one woman team. With 20+ weddings on her own before Fall for Florals, Lindsey was designing wedding florals for her friends and family in the years leading up to the launch of Fall for Florals. Being new in the industry at the time, Lindsey was intrigued by all the styled shoots she was seeing on social media and soon found herself involved in a few to eventually designing a few of her own. Through building connections in the industry and learning more about weddings, Lindsey found herself excited and always eager for more designing opportunities. Throughout 2017, Lindsey took every chance she could to develop and perfect her style. Dipping her toes in a few different styles, she would now confidently define her esthetic as a refined organic with designs being imperfectly yet perfectly balanced and timeless. In the summer of 2017, Lindsey was introduced to Kelly through a mutual friend. At the time Kelly had just left her job after 7 and a half years at a local flower shop and was looking for a bit of a change, while still being able to exercise her creativity with flowers. While it first started as an odd job helping here and there for Kelly, it soon turned into a partnership, both believing it was kismet. During their time in the studio, Lindsey and Kelly would chat about where they were in their lives, where they wanted to be in 5 years and the dreams they were chasing. They soon discovered they had similar values and odd eating habits. Everything aligned them to be a perfect match for partnership (+ friendship). By November 2017, Fall for Florals was officially a two-woman design team with Shayla joining the team quickly soon after, supporting Lindsey and Kelly on all of their wedding executions. Shalya and Lindsey were first introduced at Pacekids Programs where they both work at the time. At first they were just acquaintances but it didn't take long for their friendship to form. It wasn't until Shayla got engaged, that she discovered how much more she enjoyed planning and executing events. Shayla first tipped her toes in the wedding industry when she helped Lindsey on a couple of weddings early on. Now a pro with all the mechanics of installs and set ups, Shayla spends most of her weekends with Lindsey and/or Kelly 'wedding hopping' from venue to venue. March 15th 2018 marks the day Lindsey officially left her day job and decided it was time to focus all her attention on what she knows and loves most: wedding floral design. Now both full time business owners and floral designers, Lindsey and Kelly split their time between learning the foundations and logistics of owning/running a business and floral designing. By the summer of 2018, Fall for Florals became a 4 woman team, with Tram joining as the wedding consultant. Since 2017 Fall for Florals has been featured in Dote Magazine, Weddings Bells, Dear Gray Magazine, Rocky Mountain Bride, Confetti, Trendy Bride, Bridal Musing and Hey Wedding Lady.